Prof. Guedes’ interview is available on YouTube. For direct access, click here. Prof. Guedes gave the Inaugural Class talk for the Graduate Program in Climate Science at the Federal University of Rio Grande do Norte. The talk was entitled How climate change connects to labor supply, economic growth, and insurance demand and the beamer is available upon request (email to: contact@gilvanguedes.com). Prof. Guedes will be one of the honored professors for his role at the Socioenvironmental Science Undergraduate Program in March, 2018. The Population Studies Center (PSC) at the University of Pennsylvania has recently published a spotlight article on Prof. Guedes’ experience during his sabbatical at UPenn. 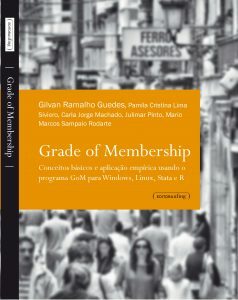 Prof. Guedes has published a book about applied the Grade of Membership method. The book, entitled “Grade of Membership: conceitos básicos e amplicação empírica usando o programa GoM para Windows, Linux, Stata e R”, was written in collaboration with other colleagues (Prof. Carla J. Machado – School of Medicine and Public Health – UFMG, Brazil; Prof. Pamila L. C. Siviero – School of Actuarial Sciences – UFLA, Brazil; Prof. Mario M. Rodarte – Department. of Economics – UFMG, Brazil; Grad. Student Julimar Pinto – Department of Demography – UFMG, Brazil) and is focus on the empirical use of the GoM model for the social and health sciences. The book includes the programs for Windows, Linux, Stata, and R, in addition to an introduction to the theoretical method, and partical guides on how to manage results for publication. The book was published under the Population & Economics Series – Cedeplar/UFMG, by UFMG University Press. LATEST PROF. GUEDES' TALK: "Climate Change and the economy: regional impacts on labor supply and demand for insurance"
Prof. Guedes‘ talk at the Statistics Graduate Seminar – Universidade Federal de Minas Gerais on “Climate Change and the economy: regional impacts on labor supply and demand for insurance” can be accessed upon request. Please send a request to: contact@gilvanguedes.com, informing your name and institutional affilitation. Prof. Guedes has been recently elected the new Associate Editor of the Brazilian Journal of Population Studies (www.rebep.org.br). Along with Prof. Simone Wajnman (Editor), he will serve the main demography Brazilian journal over 2017 and 2018. Prof. Guedes has been recently invited to join the Research Group on Economy and Demography of Health (GEESC) as one of its core researchers, along with Mônica Viegas (Cedeplar Director), and Kenya Noronha (Cedeplar). 1) Prof. Guedes received funding from the Brazilian National Research Council (CNPq) and the Minas Gerais Research Funding Agency (FAPEMIG) for a project entitled: “Demography of Exception: Reproductive Intentions and Migration in a context of Zika Outbreak and Socioenvironmental Disasters“, in collaboration with colleagues from Universidade Federal de Minas Gerais (Prof. Alisson Barbieri and Raquel Zanatta – Demography Dept., Profs. Dimitri Fazito and Marden Campos – Sociology Dept.) and University of Texas at Austin (Prof. Letícia Marteleto – Sociology Dept.). 2) Prof. Guedes is currently the PI of a large project, funded by the United Nations Fund for Population Affairs (UNFPA) and the Brazilian Ministry of the Environment (MMA), entitled: “Population Dynamics and Its Implication for the Agenda of Sustainable Development“. The project involves five main themes: (1) socioenvironmental profiles of the Brazilian municipalities; (2) a demand model for sustainable consumption in Brazil; (3) urban expansion and its overlap with environmentally sensitive areas; (4) the socio-spatial dynamics of metropolitan slams and protected areas in Brazil; (5) the regional and national climate impacts on the economy through shocks in agricultural and labor productivity. The project envolves researchers from 5 universities and more than 30 researchers, from undergrads, to PostDocs, to professors. 3) Prof. Guedes is co-PI on the InterAmerican Institute (IAI-NSF) funded project LUCIA (Land Use, Climate and Infection Diseases in Western Amazonia). The 5-years project involves colleagues from UFMG (Alisson Barbieri, PI; Laura Wong, co-PI) and other institutions: Fiocruz (Ulisses Confalonieri); Duke University, USA (William Pan); Universidad San Francisco de Quito, Ecuador (Carlos Mena); and Universidad Peruana Cayetano Heredia, Peru (Alejandro Llanos Cuenta; Jaime Miranda). The project uses the social-ecological systems approach to understand the relationships between population changes, LULCC, climate change and infection disease transmission in three Amazonian sites: Machadinho, Rondônia (Brazil), Madre de Dios and Loreto (Peru), and the Northern Ecuadorian Amazon. The project combines data on climate, vectors, and social surveys, and intends to apply the Agent-Base Modeling approach to identifying emerging properties of the SES in the Amazon under climate stress. Prof. Gilvan Guedes has served as the Chair of the Undergraduate Program in Socioenvironmental Sciences, Federal University of Minas Gerais from May 2015 to July 2016. Prof. Gilvan Guedes has served as the Deputy Chair of the Graduate Program in Demography, Federal University of Minas Gerais from June 2015 to July 2016. Prof. Guedes was received the Travel Award from IUSSP to participate of the 2017 IPC in Cape Town, South Africa. Prof. Guedes was awarded the Research Productivity Scholarship (PQ II), from the Brazilian National Research Council (CNPq) from 2015 to 2018. Prof. Guedes was awarded an scholarship Mineiro Research Project (PPM) from FAPEMIG, from August/2014 to June/2016.